Happy Thanksgiving to all those in the United States who celebrate! If today were to be the last day of your content marketing career, would you feel that you left a meaningful mark on your industry – or at least made a positive influence on those who came across your work? As content marketers, we are always reminded of the need to focus on our audience and their needs. In a way, this relationship gives each marketer the privilege of mentoring consumers by the thousands. Think about it: You use your skills and experiences to guide their journeys; you deliver useful advice and information that might ease their struggles; and you celebrate your connections with them as they reach the milestones of success you designated for each campaign. 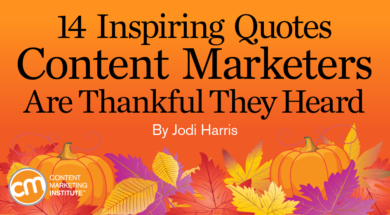 With this vision of mentorship in mind, our editorial team asked a few influential experts in the Content Marketing World community to share the best piece of advice they received from someone whom they look up to in the industry or someone who has inspired their content marketing career. Their favorite nuggets of wisdom are noted below, along with some encouragements our CMI team members have considered invaluable to their own career success. CMI founder Joe Pulizzi gave me that piece of advice. And he showed me the survey results showing that the companies effective at content marketing are five times more likely, not just to have a mission statement, but to document it and define it. And now, that’s what I help brands do: document what they’re doing, their mission statement. I recall Gary Vaynerchuk saying that. You really don’t need to have a strategy. It’s simply opening up your phone, taking pictures, recording video about your journey because seeing your journey helps people feel invested in you. They will want to work with you because people do business with people they know, like, and trust. Documenting your journey enables you to establish that trust with your potential customer or client. A colleague of mine and good friend Brian Fanzo lately has been using that phrase. It’s easy, especially if you are a creative, to get hung up in your process or to want everything to be perfect. And that is wonderful; but sometimes it can keep you from putting things out. I’m trying to adopt that mindset and just push the button and put more things out. One of the best tips I received was from Pam Pulizzi. I had a horrible habit of checking emails while on vacation and was doing so one morning when I was in the Outer Banks with my family. Pam noticed I was checking emails and told me she was being selfish, but she couldn’t have me coming back tired. For the first time in my 20-plus-year career, I totally unplugged. And since then, I’ve gotten really good at it. A gentleman named Tom Clarkson shared this big piece of news with me. When you’re working with a small budget and limited staff, you’ve got to get super creative to punch above your weight class. That little nugget from Tom is helping me do that. He gave me the permission to break some rules in a space that wasn’t really used to breaking rules. It was an academic environment, so they were very conservative. He gave me the space to really explore, and it was extremely helpful. On the very first day of my very first job out of college, my manager said that. It provided relief to just know that yeah, I’m OK and I’m allowed to make mistakes. As long as we recover, make that change together, communicate, it’s going to be OK.
We all are a direct marketer at heart. A mentor, Heather Lloyd-Martin, told me from day one she was a direct marketer at heart and that we all are. The value is really in getting that this is business and bringing the context of lead generation sales to everything that you do. For the longest time, my job title defined who I was. But when I left that job, I had to stand on my own two feet and explore what else defined who I am. It’s a lot of reflection and soul searching to find out what defines “me” and who I am. When I decided to leave the corporate world and become an independent consultant, one of my mentors asked, “What do you want to do? What do you want to sell? What kind of service are you providing?” I was like, “OK, that’s a good question, I can do a lot of things.” Then she said, “You need to know yourself. Know yourself well.” And I think that was very important. This advice came from a high school teacher of mine. It radically affected how I approach my career (and life in general). He told me not to underestimate my value. Don’t accept being treated as less than my worth. Some people wave away praise as if what they have done means nothing. Don’t let this be the case. But if it does happen and you find yourself upset, remember the golden rule. Kindness can reap unexpected rewards. Now, the range of our freedom to change direction in our lives depends on so many things: confidence, talents, skills, and yes, certainly privilege. But I do agree with Peter when he writes, “Values should be our ultimate test.” And per my grandfather, I’d add interest and passion. Don’t get stuck on one idealized form of your career, but rather focus on constantly increasing the range of options you have to change your career based on your values, your interests, and your passions. Before you get to the who and the what, know why you’re doing what you’re doing. Simon Sinek’s book, Start With Why, made a huge impact on me. He said you need to know why you’re doing something to help feed the who, what, how, and where of content. Who is your audience? What do you want to say to them? How are you going to say it to them? Where are you going to say it? If you don’t know the why in the first place, there’s no sense of going down the rest of the path. An old Japanese idiom translates to “study something old to learn something new.” When you’re looking for ideas, when you’re looking for inspiration, when you’re looking to see what has worked, looking back at what has been (especially in other cultures) is a really great way to also look forward. As marketers, we have hundreds of years of books, of theater, of plays, of oratory and rhetoric to draw upon if you want to learn something new. See what has worked for generations in the past. Jeff Bezos has a great expression: “Focus on what doesn’t change.” In content marketing, you always want to be educated, engaged, and entertained. Focus on those things. Look to the old ideas, and you will create brand new things that will amaze people. I’ve had the privilege of working with some of the best minds in this industry – people who are crazy smart, wonderfully creative, dedicated to their craft, and just plain inspiring. And one thing most of them have had in common is that they weren’t afraid to follow their instincts and forge their own path – even when their chosen direction defied conventional wisdom or lacked an established framework. Collectively, they’ve shown me that content marketing is not rocket science. There’s no single, definitive formula for success in this industry (or anywhere else in life). No one has it all figured out (and anyone who claims they do is probably being paid on commission). Experiment with new ideas, techniques, and approaches. Listen to and learn from others, but don’t let their opinions sublimate your personal drive to innovate. Dewitt’s words – like his gorgeous works of art – should inspire us all to be more open to the possibilities and use our positions as influencers to “celebrate what’s right with the world.” As you reflect on the things you are grateful for today, I hope you take a minute to be mindful of the mark that your positive experiences and perspectives can make – not just on your audiences and your fellow practitioners but on the world at large. Have advice or insight you would like to share with your fellow content marketers? Consider submitting a proposal to be a speaker at Content Marketing World 2019 by December 14, 2018.